Six of Ireland’s foremost poets and spoken word artists speak about their work, and perform a poem inspired by a particular soundscape in a unique location. Starting Monday October 9th at 6pm on RTE Radio 1 Extra. Listen live on TuneIn. Monday 9th October at 18.00 on RTE Radio 1 Extra. 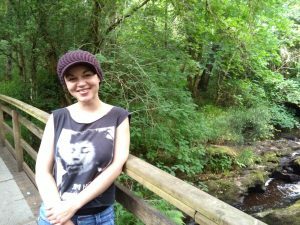 Abby Oliveira is a performance poet/writer/performer based in Derry. She has performed poetry throughout the UK and Ireland since 2006, and has been a solo performer since 2012. She has performed at countless events and festivals, including at Lingo festival, Glastonbury, Electric Picnic, Dublin Book festival. She recently won the inaugural Lingo fest poetry slam which saw her go on to support Damien Dempsey at the London Irish Centre in 2014, she has also supported artists such as Scroobius Pip, Hollie McNish and Saul Williams. She was the 2014 and 15 Lingo festival (Dublin) poetry slam champion. 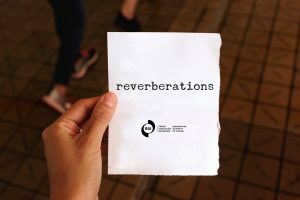 The poem ‘Patience’ was newly composed for the ‘reverberations’ series. It charts the journey from being overwhelmed with frustration and on the brink to coming back to a place of peace and patience. It was recorded on location at Ness woods and waterfall on the outskirts of Derry city. Abby also discusses her entry into poetry, her performance style and how the woods is a place of refuge for her in the programme.